The Vessel Sampling System (VM 100) allows samples to be taken from a dip pipe mounted at the top of a vessel. The three main versions differ based on their size and method of drawing the sample up the dip pipe. 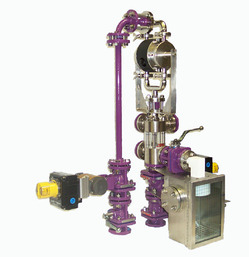 The vessel sampling systems are ideal for the sampling of batch processing within reactors or storage vessels holding intermediate product or bulk chemicals. Vessel samplers can be supplied with all wetted parts manufactured from stainless steel or PTFE/PFA-lined components for corrosive media. Our vessel mounted sampling systems are varied in their construction and often designed to meet certain specific requirements of the customers existing plant. The sample can be drawn up the dip pipe using site vacuum, eductor, recirculating pump or pressure within the vessel. Sample is drawn from vessel up dip pipe using site vacuum. Sampler is cleared by nitrogen purge and / or wash liquor. 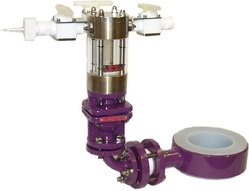 Sample can be discharged back into the vessel either through a separate nozzle or as shown here through an instrument tee back around the outside of the dip pipe. Diaphragm pump firstly creates vacuum to draw sample up dip pipe and then recirculates it through the system. All wetted parts PTFE / PFA / Borosilicate glass - No metallic wetted parts used. Sample dispensing valve of globe type allowing no product hold up cw spring return safety handle. 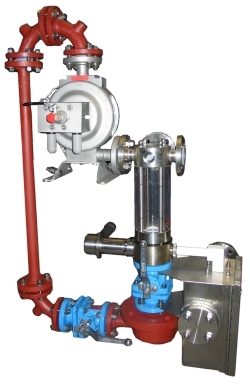 Robust PFA lined flanged manifold ports for nitrogen and wash introduction. Top manifold has spare top connection to allow future upgrade for fitment of pH probe, pressure gauge etc. Integral stainless steel safety cabinet housing bottle adaptor. 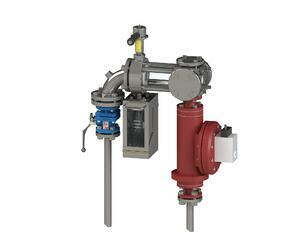 Atomac PFA lined valves used for isolation are extremely robust and offer large bores for use with slurries. All valves can be automated.